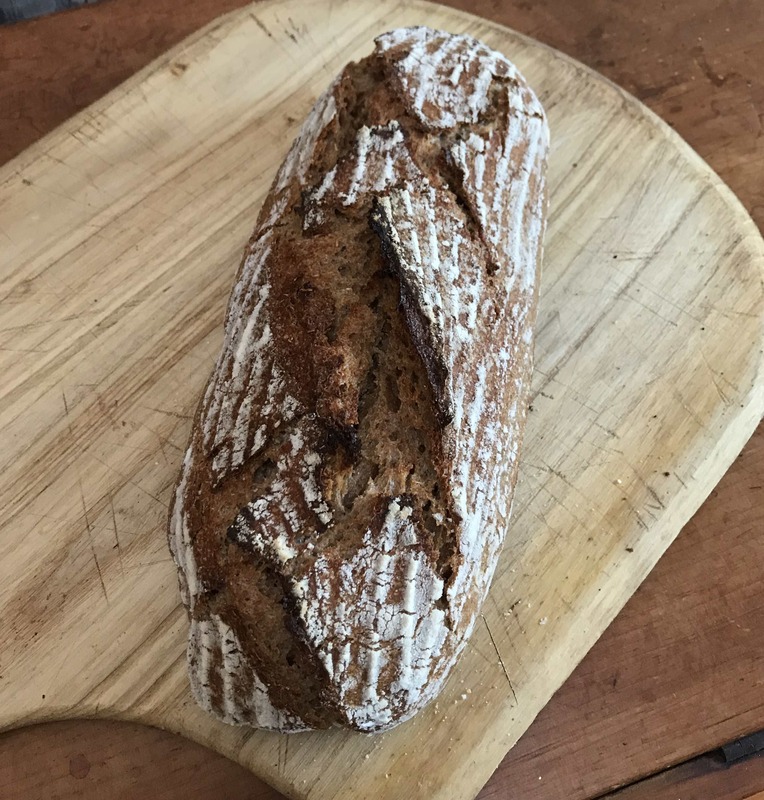 I made this with whole grain sprouted spelt flour today and it turned out quite well. 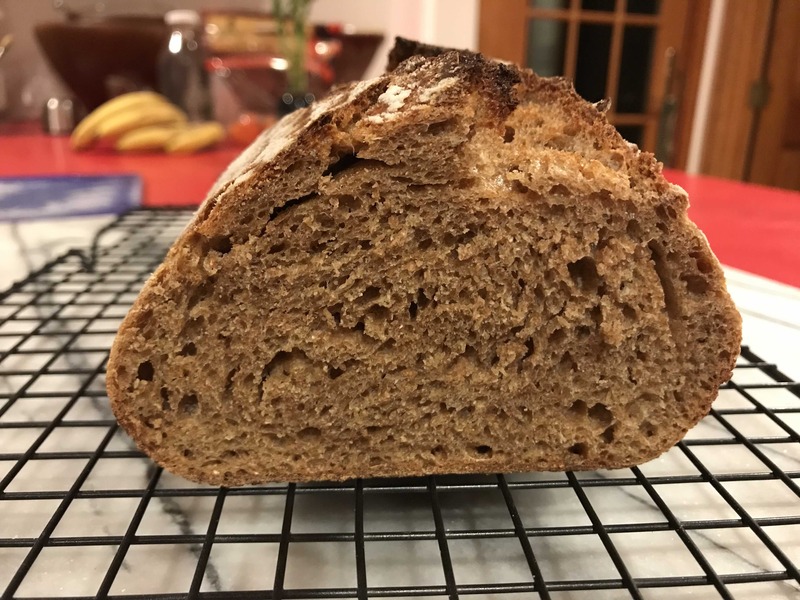 I dropped the honey because I think sprouted wheat has more fermentation off the bat and it wouldn’t be needed… I also went with a smaller loaf. I think the ratios are similar, though, because I added more water to compensate for no honey. It’s a gift but it smells so good I’m going to bake myself one soon. Wow, this is delicious! Thank you Eric for this recipe and your excellent tutorial. I can’t believe my loaf turned out as well as it did. Had a bit of a mishap when moving the loaf from the banneton into my oblong Breadtopia clay baker. 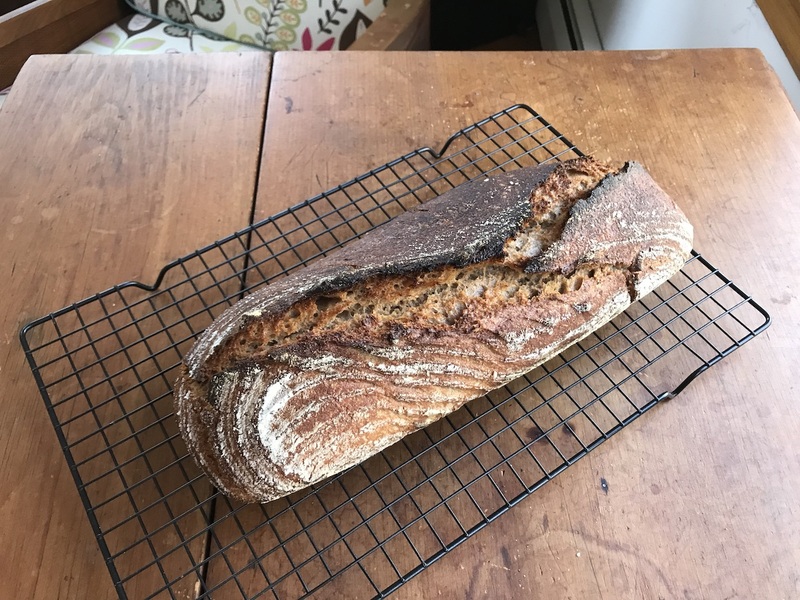 Usually I use parchment, this time I attempted to live on the edge, and the proofed loaf landed on its side and crooked. 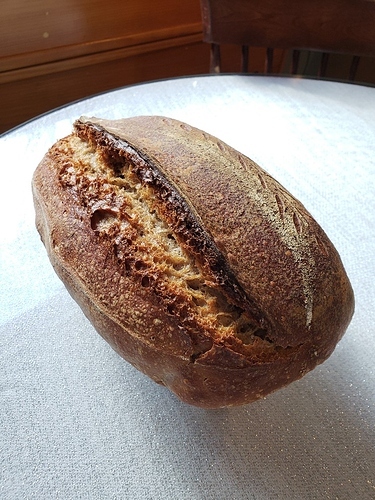 I scored it anyway, and happily the loaf straightened out and puffed right up. Turned into a surprisingly pretty loaf. I’m surprised by the somewhat open crumb. So happy to have found another great recipe for a 100% whole grain loaf – I’ll be making it a lot, I’m sure. Has a lovely sourdough tang. Details: made the dough using 2 T of agave, rested it an hour and then did four stretch and folds spaced 20 minutes apart. After that the dough bulk fermented on the counter (cool winter temps) for about 10 hours. Proofed 1 hr 25 mins (partly in a 100 degree oven), then baked at 450 for 42 minutes (Lid on 30 mins, lid off another 12, and when I pulled it out the internal temp was already at 210). Had to run errands so didn’t cut into it until about 4 hours after it came out of the oven. It’s perfect. BTW I used Bob’s Red Mill organic whole spelt flour. I haven’t yet invested in a home mill/grinder but I think that will happen, hopefully soon. Made this for the third time yesterday. I have baked this whole spelt loaf each of the last three weekends. Each time it’s been fantastic, though this is my best loaf of the three. 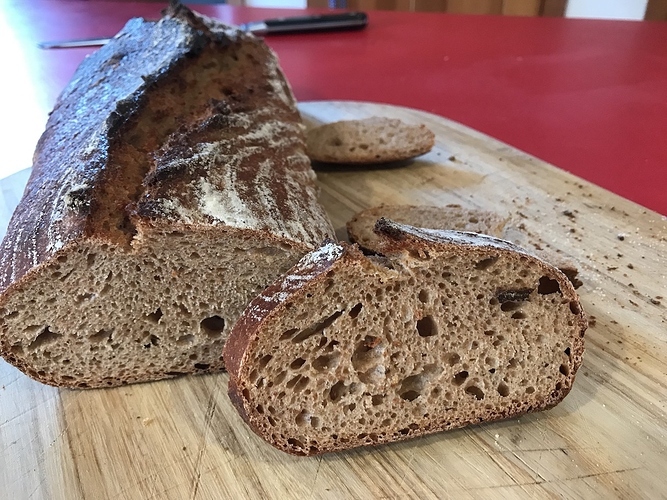 I never knew I liked spelt, and so far this is probably my favorite among the many breads I’ve made – which is great given that it’s also among the most nutritious. The dough was not as wet as the previous two times I made this bread, and it doesn’t have the same open crumb. But no complaints here – it’s delicious. I could not be more pleased except that the loaf did not eject from my romertopf. It burned around the bottom edges. I can work on that. 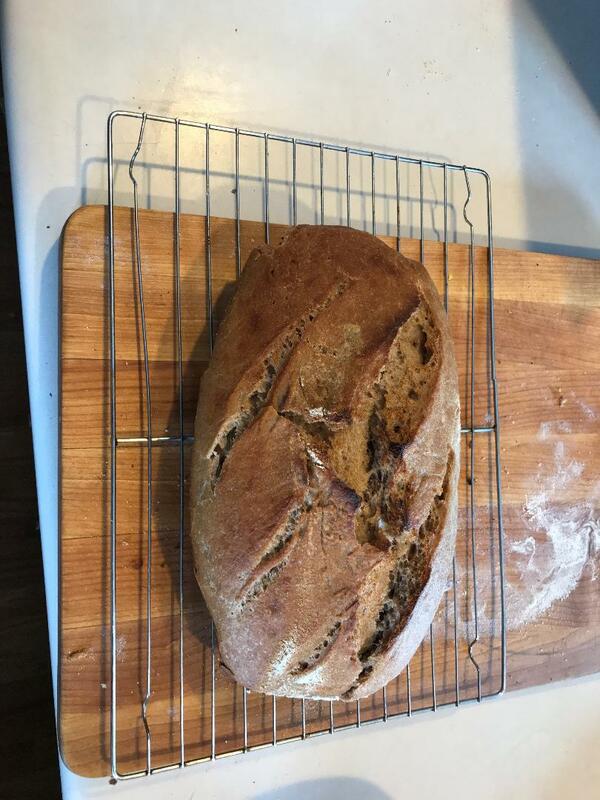 I used a mixture of spelt and white flour starter. BTW, I got my dough whisk and romertopf from breadtopia a few years ago.